SUMMARY: In this week's chart, we compare survey responses for top sources of traffic, and conversion of website visitors. Share your thoughts and insights on this topic in our LinkedIn discussion group. In the MarketingSherpa 2012 Lead Generation Benchmark Report, we learned that organic search is the top source for generating website traffic. But, much like actual lead generation, volume alone doesn’t offer much value. In many cases, it’s the quality of both leads and website traffic that generates revenue and returns. 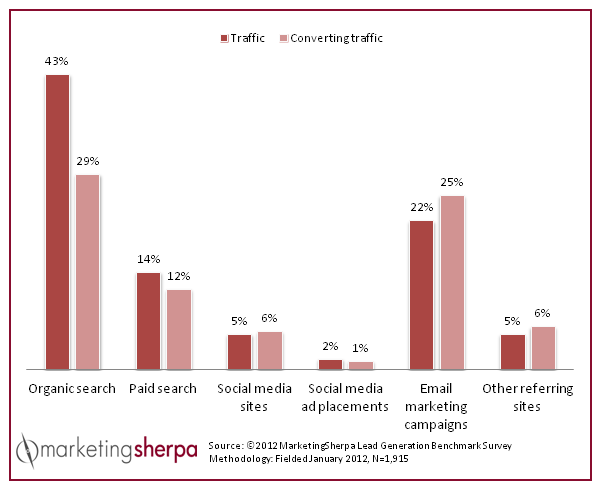 The following chart compares the responses for top sources of traffic, and top sources for conversion, of visitors on study participants’ websites. Q: Which of the following sources generates the GREATEST VOLUME of traffic coming to your site? Q: Which of the following sources generates traffic with the greatest CONVERSION RATES on your site? In the chart above, the darker bar on the left shows response to the greatest volume survey question, while the lighter bar on the right shows response to the conversion rate question. Survey respondents indicated that organic search is the top source for volume and quality of website traffic. When buyers research products online, the search engine is often where they begin, and the majority of search engine users appear to trust organically placed ads over paid advertisements. This experience creates a powerful combination of volume and quality to websites that are well optimized for organic search results. Why is there such a discrepancy between organic search and email marketing campaigns? Email marketing offers marketers the opportunity to generate a high volume of targeted traffic to specific landing pages. This creates an engaging experience that is ideal for qualified lead generation. Yet, despite the fact that email campaigns generated about half of the overall traffic of organic search, they were responsible for very similar conversion rates. Has your company seen similar success in generating traffic with email marketing campaigns? Have your optimization efforts made organic search your most effective way to generate leads that convert? Are social media ads effective enough to include in future planning? Despite social media no longer being a fledgling channel, our respondents indicated that social media ad placements generated just 2% of overall traffic, with just 1% that converted. Has your company invested significant time and resources into strategic social media ad placements? What were the results? Has low performance made you reconsider social media ads when budgeting for future lead generation efforts? For more information about lead generation tactics, be sure to download the free excerpt from the 2012 Lead Generation Benchmark Report.